Facebook's acquisition of developer Snaptu has produced its first results: on Wednesday, Facebook released the "Facebook for Every Phone app," a Facebook app for feature phones, frequently forgotten in the race to smartphones. 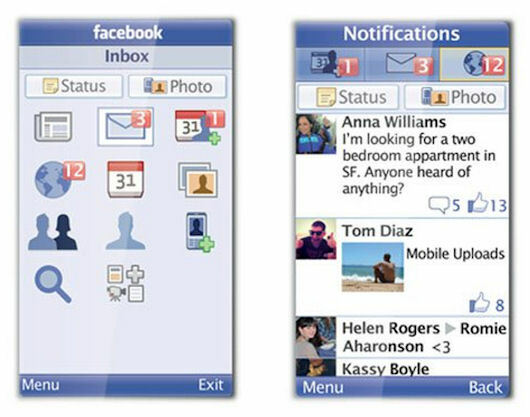 “Facebook for Every Phone” is a downloadable native mobile app which Facebook says is compatible with 2,500 different Java-enabled feature phones. It's an improved, rebranded version of Snaptu's “Facebook for Feature Phones” app. The app includes Facebook’s most popular features, such as News Feed, Inbox, and Photos, but users can also upload photos and Find Friends from their phone’s contacts. Users can install the app by entering d.facebook.com/install in their phone's browser. Facebook has also partnered with many carriers worldwide to get its users free access, by providing free data service. The data service is free for 90 days, but even afterward, Facebook said, their app is designed to use less data than other Java apps or mobile sites, so it will be less costly to use than other apps (at least, that's what they say!). Watch a video on downloading and using the new app, below.